The map includes remote proctor locations across the world. DELTA Testing Associate Brad Collins led a team over the summer of 2017 to update the Locate a Proctor Map, a resource allowing students to find pre-approved remote proctors available in their area. Navigating from the Testing Services tab on the Online and Distance Education website, the map is located at the bottom of the Remote Locations webpage. Prior to last summer, the map mainly provided proctor locations within North Carolina. While students in need of a remote proctor are usually in state during the spring and fall semesters, many are traveling between May and August. “During summer, a lot of students are on the go, they’re taking internships, they’re going back home,” said Collins. 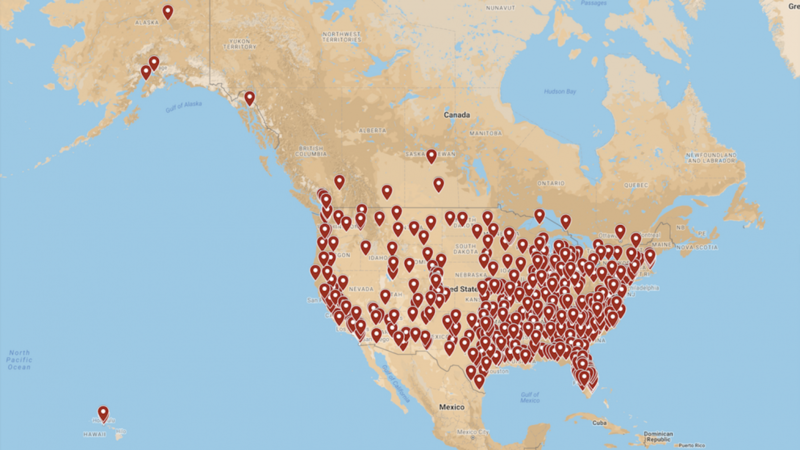 Currently, the map includes 662 different proctor locations across the United States as well as a few in other countries. Collins had to ensure the map only included proctors that met DELTA’s guidelines and shared the views of the National College Testing Association (NCTA). Senior Associate Director of Online and Distance Education Administrative Services Sharon Broere acquired NCTA’s Consortium of College Testing Centers dataset and provided it for Collins’ team. The map was updated by combining this dataset with DELTA’s dataset of pre-approved proctors. However, the NCTA dataset was organized differently from DELTA’s. Collins and his team had to properly reformat the list in order to merge the two datasets into one spreadsheet for the first draft of the map. 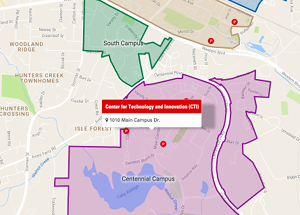 “After creating an initial mock-up map, we revised it once more to remove any bias from the student’s perspective that the NCTA’s proctors would be treated differently than DELTA’s pre-approved list,” said Collins. Collins credits Broere, as well as testing colleagues Vince Lastreto and Kara Marschalk and former testing associate Shamsa Visone for helping combine the datasets. Editing the map took approximately five to six weeks. Even after completing this process, Collins continues to search for other locations to add to the map in order to provide students with more options. “Each one of those had to be manually plotted, but it’s worth it in the end,” he said. Outside of the U.S., the map has few remote proctoring locations available to students. “We talk sometimes about adding some more international spots on that map because we do have some students that are doing study abroad programs that need some of those options,” said Collins. Ultimately students are responsible for finding their own remote proctor, but the Locate a Proctor Map can make the process much easier. “Our hope is that a better, more inclusive map would alleviate the stress and frustration of as many students as possible,” Collins said. He also wants to further integrate the map into the Request a Remote Proctor Form in order to streamline the request process for students. “We’ve been talking with Drew Davidson, the developer of the app, for us to actually incorporate where students can just choose a proctor on that map and that automatically fills out the form for them,” said Collins. This would speed up the approval process for students and staff.